Support Lancers with a chance to win this magnificent art piece! 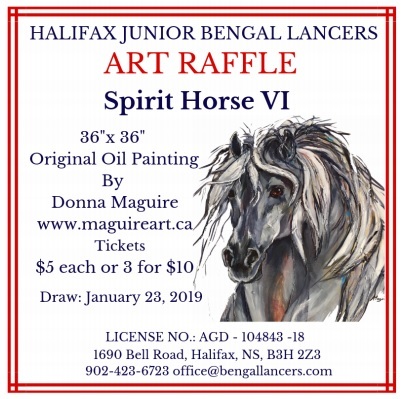 The Lancer Fundraising Committee is holding an Art Raffle for “Spirit VI”, an original oil painting by the talented Donna McGuire. Valued at over $4000, this is a fantastic chance to own a gorgeous statement piece of art. Tickets are $5 each or 3 for $10 and can be purchased at our office or through any Lancer! The draw will be January 23, 2019 at our Annual General Meeting. The winner will be notified by phone. The painting is currently on display at Domus Realty at 5880 Spring Garden Road. Take a look at this beautiful piece any Monday to Friday from 9-5pm! 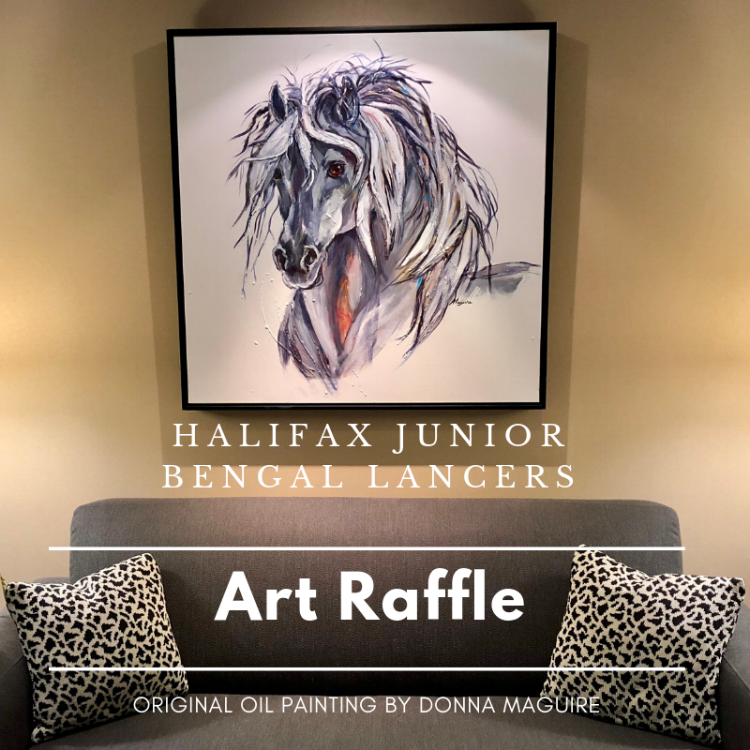 A proud Lancer alumni, Donna Maguire graciously donated the piece to help us offset the costs of our summer quarantine. Donna rode at Lancers from 1947-1948 and she heard about our quarantine in the Chronicle Herald. Of her motivation for donating the painting, Donna explained “I was compelled to do something and this is something I can do”. “Lancers was not just part of my life but it made me part of who I am and I just love horses”, she added. Donna has her Rouges Studio gallery in Indian Harbour, NS near Peggy’s Cove. Donna Maguire was born and educated in Nova Scotia. In her earlier years, she studied under successful Maritime artists John Cook, Ruth Wainwright and Jean Edmonds Hancock. Donna works mainly in oils, painting not only the life and the people of the sea around her but also in portraiture. Her work is in private collections across Canada, the U.S., the British Isles and Europe. Learn more about Donna and her work at her website at www.maguireart.ca and on her Facebook page. We LOVE this painting and it is going to be hard to hand it over when some lucky person WINS it! The draw will be on January 23, 2019 so don’t miss out on your chance to win!